Memorial Day to many is a Holiday Weekend to shop, party and celebrate the traditional start of summer. However for those with friends and family who are or were in the military Memorial Day is the day set aside to remember those who gave their lives in service of our country. Many people we know and see every day have either lost someone close to them or know someone who has lost someone but may have never spoken about it. On this weekend they visit cemeteries or monuments to honor, pay tribute and think about their lost friends and family members. 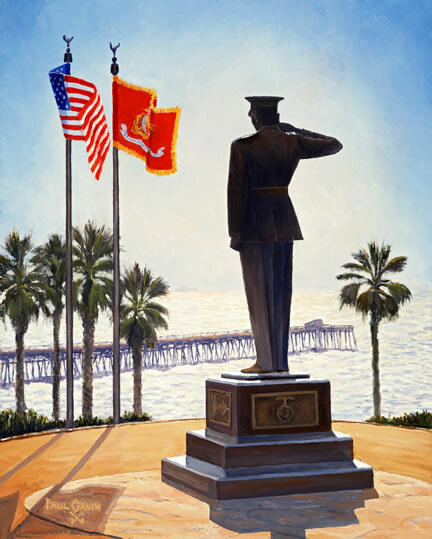 One such location is the Marine Corps Monument at Park Semper Fi in the parking lot just above the San Clemente Pier. If you can, attend a nearby memorial or visit a special monument or cemetery. Witness, feel and share the love these people have for their lost ones and the bond they share with each other. Ask if they are remembering a relative or friend this weekend – what was their story? However no matter where you are, take the extra moment to share a Memorial Day greeting with these people: your friends, neighbors, strangers and especially any current or former service men and women you know or even think might have served. Let me know if you did this and how it went. Who did you meet and what did you learn?